It’s kind of funny. As I’ve gotten older, I’ve gotten more into the Rolling Stones, instead of getting into them while I was in middle or high school, like most people do. 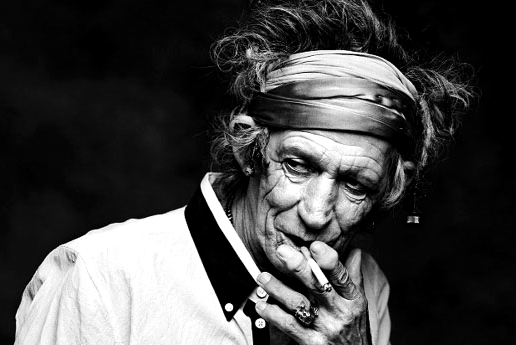 Keith Richards has become more interesting as the years go by, partially because he is seemingly immortal despite everything he has done in life. Netflix released a “rockumentary” about Richards recently called “Under The Influence.” It’s only about an hour-and-a-half in length, but reveals some interesting tidbits about a life well-spent from one of rock music’s true pioneers and mythic figures. It features a minimal amount of flashbacks and old footage, and is mostly comprised of Keith working on a new album with some friends of his, and of him driving around to various places where he remembers partying. It might sound silly to say a documentary sounds staged or cliché, but some parts of the film seemed a little bit forced. Richards tries to make a few comparisons about instruments being like “paintbrushes” and it just doesn’t sound right. The film was for the most part enjoyable, however, with Richards dropping tiny little pieces of knowledge throughout. Richards on the outside embodies a wild personality, so I guess this film tries to paint him in a more sensitive light. The film features a few guests, most notably Richards’ apparent friend Tom Waits, whose current form looks like an old beatnik school music teacher. Richards likes to brag at times, but as far as I’m concerned, he’s earned that. One thing I wish the film elaborated a bit more on is Richards’ drug addictions and usage. There is no one block of time dedicated to it, but rather little snippets throughout where Richards will casually mention something such as smoking “dirty cigarettes” on tour — cigarettes laced with heroin — or of how they arranged the speakers onstage so they could hide behind them between songs and snort coke.